You remember what this looks like, right? 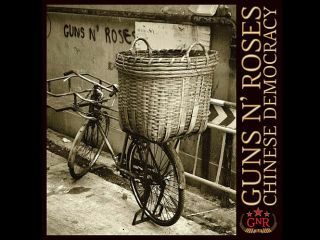 It's been a while since we checked in on Chinese Democracy's progress on the charts. And in a few more weeks, we might need a microscope to find it: after nine weeks of release, Guns N' Roses' much-ballyhooed CD has sunk to number 75 on the US SoundScan chart. In fact, since last week, the album's missle-like descent accelerated, dropping 24 places and selling a paltry 7,176 copies. Its two-month total is 530,462 units - good enough for gold status, but hardly the blockbuster it was expected to be. As of yet, Axl Rose hasn't appeared in public to promote the album; he's granted no formal interviews and, despite late-December rumors, has no tour on the books. Perhaps he's in no hurry. After all, he did wait 15 years to release Chinese Democracy. And with all things being relative, the album will certainly recoup...in 1,944 weeks. Some have opined that Chinese Democracy's dismal showing underscores the decline of rock music as a sales force. Go tell that to AC/DC: The veteran band sold a whopping 784,000 copies of Black Ice in its first week of release in the US. Its 14-week total stands at 1,969,603, which indicates the set will go double platinumby Valentine's Day. So while AC/DC are breaking out the chocolates and champagne on a sold-out tour, Axl is holed up in his Hollywood home, circling his computer, psyching himself up for another 'interview' on a GN'R fan site.